This morning, I had to leave my house at 5:45 am (not just get up at 5:45, but leave my house at 5:45), which is very, very unusual for me. I can barely get up before 8 am most days! I wanted to go to the Mass and Breakfast for Catholic Business Leaders in the Archdiocese of Toronto, sponsored by the Archdiocese of Toronto, Salt + Light Television, Regis College and the Meritus, an Archdiocesan Group for Catholic Business Leaders, held at St. Paul’s Basilica. I always want to grow in my faith and to support Salt + Light whenever I can, so I was glad to go. My other interest in going to this particular Mass and Breakfast was to meet the guest speaker, the Most Rev. 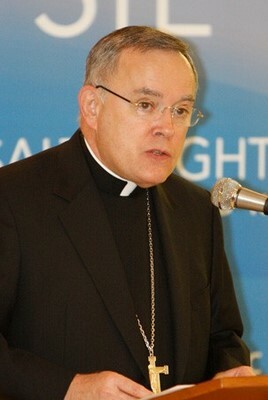 Charles Chaput, O.F.M. Cap., Archbishop of Denver. Not only is he an outstanding, courageous leader and champion of the dignity of human life, he is also a popular writer! His most recent book is Render unto Caesar: Serving the Nation by Living our Catholic Beliefs in Political Life. Archbishop Chaput and I will be the speakers for the third evening encounter of Nothing More Beautiful, a new evangelization initiative in the Archdiocese of Edmonton, set for April 30th, on “Our New Life in Jesus Christ”. I was eager to meet the person God has planned for me to partner up with, in order to experience and share His love in a more profound way. I was extremely delighted to meet a good-humoured and bright-eyed individual in Archbishop Chaput. The title of his talk was “Character and Circumstance”, and I’d like to share with you a few tidbits I’ve learned, which could be helpful for you in your reflections during Lent. The Archbishop started with a quote: “History is a record of the encounter between character and circumstance.” We often can’t control our circumstances but we can control our actions – and that’s what has consequences for ourselves and others. And how do we need to live? To live freely and responsibly – in business, in law, in culture. And if what we do, what we create, reveals who we are, then the past five months’ economic meltdown bears an unflattering light on our souls. And it’s not that money is the problem. The Archbishop states that people often misread Scripture when they claim that it says money is the root of all evil. The Bible says that “the love of money is the root of all evils” (1 Tim 6:10). Therefore our guiding principles in our actions need to be directed towards others, not ourselves. What he meant is this. Every human person is a child of God designed from conception to live forever. But every nation and every culture will sooner or later die and be forgotten. This is why the dignity of the human person – including his or her economic well-being – is at the heart of Catholic social teaching. But Catholic or not, any sensible businessperson can understand the logic of the Golden Rule. We reap what we sow. If we act like pirates, that’s what we become. If we act ethically, we create an ethical world – even if its borders only reach as far as our family, business colleagues and friends. I thought that was beautiful – any person is greater than any empire because we are meant to live forever. We are more than this world – we are destined for eternal life. What a special being a human person is!